Couldn’t have said it better myself. . .
Photo Credit: The Other 98% and MTV Act. You should go on YouTube and view the entire dialogue between him and a fan at a Q&A session. Did you see it? It’s pretty moving stuff. No, haven’t seen it, but thanks for the tip! 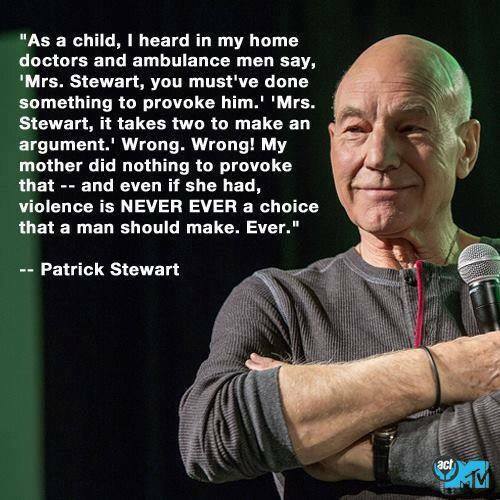 Aside from all of the truth spoken in this quote, the biggest thing that stands out to me is this: “Violence is never ever a choice a man should make.” A CHOICE. And, that’s why you should be so happy to be away from a man that made his choice violence. During those moments when you’re tempted to be lonely, remember — “his choice was violence” and that is NEVER a man’s choice! Pity for him sometimes seeps in, and I have to tell myself that even though he is EXTREMELY sick with his disease of alcoholism, his choice in dealing with everything is rage and violence. Even if he were to quit drinking, the anger would still be there, and who knows if he could ever get past it. For the sake of his son, I hope he does. I’ve always liked Patrick Stewart! Now…he is at the top of my list!! Great quote! Did you see the link Exile on Pain Street included? I need to go watch the interview. Here is the clip. I just watched it, and it made me cry. WOW!! He is amazing. More men need to follow in his footsteps. thank you for including the clip for me! !